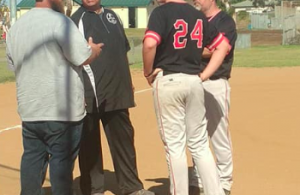 GLENDORA (12-1-2018) – Based on the numbers, perhaps Southwestern and Citrus college should exchange places when the next California state rankings are released. On Friday (Nov. 30), the 15th-ranked Jaguars remained unbeaten by toppling the No. 5 Owls, 91-77, at the Citrus Invitational.The victory extended SWC’s winning rampage to 10 consecutive games while snapping a 5-game streak of Citrus (6-2).The contest was close for a half until Southwestern erupted for 55 second-half points when Marquavian Stephens tallied 16 of his game-high 25 points. Stephens drained 9-of-12 shots from the floor. Once again, the Jaguars bench heavily contributed, as Nikko Paranada registered 17 points and Nathaniel Pearson added 16, helping the squad shoot a clip of better than 60 percent (38-for-63) from the field. On Saturday, the Jaguars meet Victor Valley at 5 p.m., then the Owls host No. 3 Fullerton at 7 p.m.
No. 13 San Diego City 74, College of the Desert 62: The Knights tallied 11 straight points before the Roadrunners answered, building a 13-point halftime cushion. 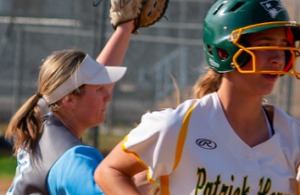 The Knights maintained that number throughout the second half to win their opener over College of the Desert at the Grossmont College Invitational. Joseph Riley paced SDCC (6-5) with 16 points, while Robby Robinson added 15. However, the difference proved to be the Knights’ rebounding, holding a 49-37 edge to control the ballgame. Robinson led the way with 17 boards. He also blocked 3 shots. For Desert (3-3), Sam Skipper led all scorers with 23 points but shot just 7-for-17 from the field ad 6-of-12 at the foul line. No. 16 Cerritos 81, Grossmont 43: Prior to the creation of the Pacific Coast Athletic Conference, the Griffins played in the original South Coast Conference of the 1970-80s. And Cerritos would regularly beat up on Grossmont as a conference rival. Some 35 years later, the Falcons continue to dominate the series, including Friday’s (Nov. 30) opening-round victory at the Grossmont College Invitational. The winless Griffins (0-9) stayed close for a half, but they were run off in the second half, out-scored 42-19 by the 16th-ranked Falcons. 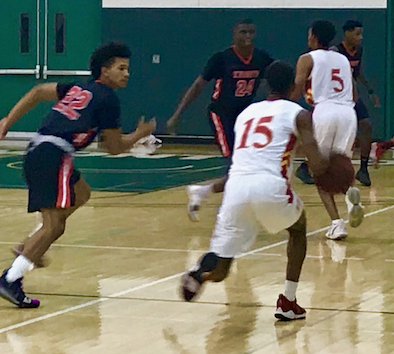 Cerritos (5-1), which is located in Norwalk, received 18 points from Cody Wilkes to share scoring honors with Grossmont’s Josh Peloquin, who also led his club with 6 rebounds. 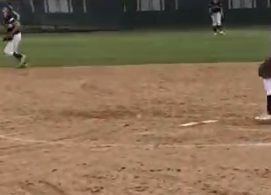 “We are the highest ranked 0-9 team if that makes sense because we play teams like Cerritos,” Grossmont College head coach DOUG WEBER said. “Yes, saying we are young is a cliche. Our ranking is our RPI. I tell my kids that there are three seasons, non-conference, conference, then postseason. 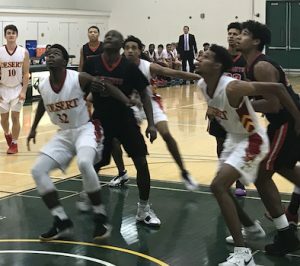 San Diego Miramar 76, Cuyamaca 68: In a PCAC North-South contest at Hourglass Gymnasium in Mira Mesa, Blake Seits had 17 points in the win over Cuyamaca. Cole Cummings, of Miramar, added 14 points in the victory over Cuyamaca for the Jets. Rio Hondo 79, MiraCosta 76: No reported on this Antelope Valley Tournament first-round ballgame in Lancaster. L.A. Harbor 85, Imperial Valley 83: No report on this game to open the Mt. San Antonio Tournament in Walnut.